A ration is the amount of feed that is fed to livestock during a 24-hour period. Sheep should be fed rations that have been properly balanced for energy, protein, minerals (especially calcium and phosphorus), and vitamins. If balanced rations are not fed, you may not be meeting the nutrient requirements of the sheep or lambs you are feeding or you may be exceeding their requirements. There are many potential consequences to not feeding sheep and lambs balanced rations. Ration balancing will also help to determine least-cost feeding options. There are five steps to balancing a ration. Sheep with different nutrient requirements need to be fed differently. A sheep's nutritional requirements are based on its age, size (weight), and stage and level of production. Lambs tend to have higher nutritional requirements because they are still growing. Early-weaned (younger) lambs have higher nutritional requirements than late-weaned (older) lambs. Lambs with high genetic potential for growth have higher nutritional needs than lambs with low to moderate genetic potential. Genetic potential is usually estimated by frame size. When nutrition is not a limiting factor, larger-framed breeds and lambs will usually grow faster than small-framed breeds and lambs. Forage alone does often not meet the nutritional requirements of fast growing lambs. 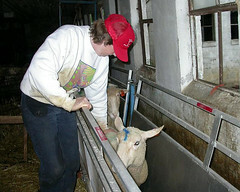 Lambs and yearlings often need to be fed for both growth and production (gestation and lactation). 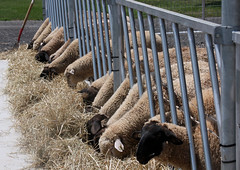 Ewe lambs that will be lambing for the first time at 12 to 14 months of age should be fed separately from mature ewes. They don't necessarily need more feed, but they usually require a more nutrient dense diet (e.g. higher energy and protein). Size affects the level of nutrients that a sheep requires. Obviously, a 225-lb. 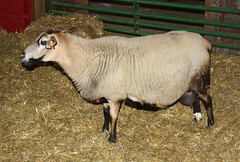 Suffolk ewe requires more nutrients to maintain herself than a 110-lb. St. Croix ewe. All shepherds should have access to a set of scales. No one can accurately predict weights. Unfortunately, weigh tapes are not suitable for sheep, due to their varying coat types and lengths. A ewe's nutrient requirements change throughout her production cycle. They increase at the time of breeding and during her last six weeks of pregnancy and are highest during the first 6 to 8 weeks of lactation. Ewes carrying triplets have higher nutritional requirements than ewes carrying twins, and ewes carrying twins have higher nutritional requirements than ewes carrying singles. The more lambs a ewe is nursing the higher her nutritional requirements will be. While litter sizes are not usually known ahead of time (unless ewes are scanned for pregnancy determination and fetal numbers), most producers have a general idea of the reproductive rate of their flock and know which ewes usually give birth to multiple lambs. The nutrient requirements of sheep (and other animals) have been determined by the National Research Council (NRC). The requirements are updated periodically. 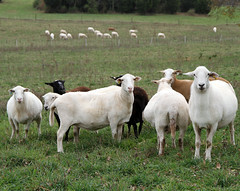 The requirements for sheep (and other small ruminants) were most recently updated in 2007. Many publications and software programs still use the NRC requirements from 1985. Besides the NRC book, Nutrient Requirements of Small Ruminants, there are various other places where the nutrient requirements of sheep and lambs can be found. 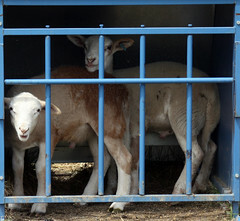 Many university facts sheets list nutrient requirements of sheep and lambs. 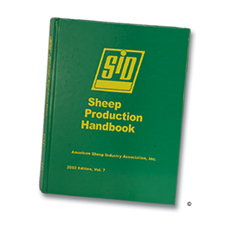 The nutrition chapter of the Sheep Production Handbook has tables giving the nutrient requirements of different classes of sheep. Other books usually give abbreviated lists of nutrient requirements. Nutrient requirements are always given on a dry matter (DM) basis. Amounts need to be converted to an as-fed basis to determine how much to feed. Most common feeds are around 90 percent dry matter. Some feeds contain significantly more moisture, e.g. silage, haylage, balage, fresh forage and green chop, hydroponic fodder, and many byproduct feeds. The availability of feedstuffs varies by geographic location, year, infrastructure, and individual farm. If a feed crop is grown or manufactured locally, it is more likely to be available as a livestock feed ingredient. In some years, growing conditions (e.g. 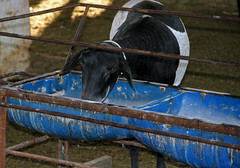 drought) may limit the availability of a feedstuff or affect its quality. In livestock production areas, especially dairy areas, there are likely to be more feed stores, mills, and dealers, giving producers more feeding options. Remote areas and extreme climates often have few choices. In addition, just because a feedstuff is available doesn't mean a producer can use it. 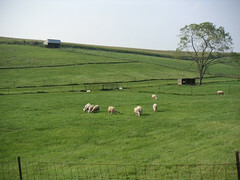 Small farms have many limitations. Many lack the equipment necessary to feed silage and round bales of hay or store bulk quantities of feed. As with the nutrient requirements, there are several places to find and ways to determine the nutrient composition of different feedstuffs. Many of the same books that give nutrient requirements of livestock have feed composition tables, e.g. 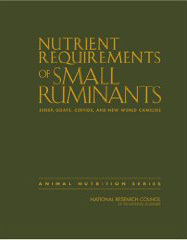 NRC's Nutrient Requirements of Small Ruminants and the Sheep Production Handbook. 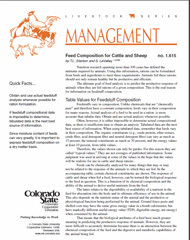 Colorado State University has a online fact sheet that provides feed composition tables for sheep and cattle. Beef Magazine also has feed composition tables that can be downloaded. The values found in feed composition tables are usually fairly accurate for feedstuffs that do not vary much in composition, e.g. 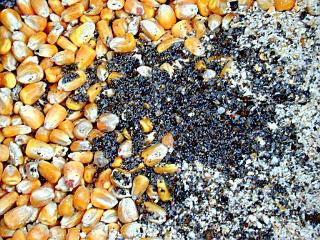 grain and oilseeds. For feeds that vary significantly in nutrient composition, e.g. hay and by-product feeds, it is better if actual values are used. Any feedstuff can be analyzed at a forage testing laboratory. A forage test provides a wealth of information for a marginal cost. Some companies or government agencies may do forage testing for free. If commercial feeds are being fed, the nutrient composition of the feedstuff will be on its label. Feed labels usually give the percentage (sometimes minimum and maximum)of crude protein, crude fiber, crude fat, ADF (acid detergent fiber), calcium, and phosphorus, as well a list of the feed ingredients. Mineral mixes, blocks, or tubs will have a more extensive listing of vitamins and minerals. Rations can be balanced by hand (using simple math), online, and using ration balancing software. No matter which method is used to balance the ration, the same information is required: a description of the animals, nutrient requirements of the animals, available feedstuffs, and composition of feeds. If rations are balanced online or ration-balancing software is used, nutrient requirements and feed inventories will be build into the programs. Programs usually allow the user to alter the nutrient requirements and feed compositions and add custom feeds. Rations can be balanced by hand using paper, a pencil, and simple math. You're going to balance a ration for mature ewes that average about 155 lbs. 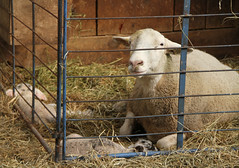 They are nursing three-week old twin lambs. Step 2. Look up the ewes' nutrient requirements. Step 3. Determine what feedstuffs are available. You have barley, a mixed clover- grass hay, and a commercial protein supplement. The values for barley were taken from the feed composition tables. 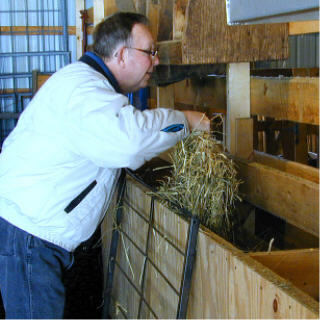 The hay was analyzed at a forage testing laboratory, so actual values are given. For the commercial protein supplement, we used the values from the feed label. The easiest way to balance a ration is to start with the forage (usually hay). Determine how much hay you are feeding or how much hay they are consuming (if the hay is fed free choice). 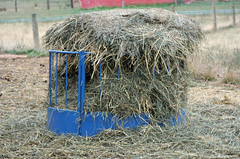 Be sure to factor in waste, as there can be considerable waste when feeding hay, particularly lower quality hays. Let's say you are feeding (they are eating) 5 lbs. of hay per day. Assume a 10% feeding loss. You have to convert it to dry matter intake (DMI) in order to do further calculations. Determine how much nutrients the 4.0 lbs. of hay is providing. The ewes require 4.0 lbs. of TDN per day. 4.0 lbs. TDN (required) - 2.3 lbs. TDN (supplied by hay) = 1.7 lbs. TDN (deficiency). The grain portion of the ration needs to provide 1.7 lbs. of TDN to meet the 4.0-lb. requirement of the ewes. Next, you need to know how much protein the grain ration needs to provide. The hay is providing 0.6 lbs. of CP. The ewes require 0.92 lbs. 0.32 lbs. CP ÷ 2.0 lbs. of grain = 0.16 or 16%. The grain ration needs to be 16% protein. You can use Pearson's Square or the substitution method to determine the ratio of barley to commercial protein supplement. Pearson's Square is an old mathematic tool that can be used to balance rations by blending two ingredients. The value in the middle of the square must be between the two ingredients that are to be mixed. Subtraction is done diagonally. Negative signs are ignored. This example shows Pearson's Square being used to determine the ratio of grain to supplement to create the 16% protein ration needed in our example. Pearson's Square shows that you need to mix 85 percent barley with 15 percent of the protein supplement to make a 16 percent protein grain ration for your lactating ewes. Similar calculations should be done to determine if the ration is meeting the calcium and phosphorus needs of the ewes. Earlier calculations show that the hay portion of the ration already meets the calcium requirements of the ewe. Because the math is tedious, many sheep producers prefer to use a computer to balance sheep rations. There are several options. The Montana State University Sheep Ration Program is a free online program for balancing sheep rations. It has a feed inventory of over 300 forages and feeds. Feed specifications and rations are stored on MSU's server. Cornell University has set up a free Access database called Feedform to formulate diets based on the substitution method. Microsoft Access is required to run the program. There are several ration-balancing programs that can be purchased. 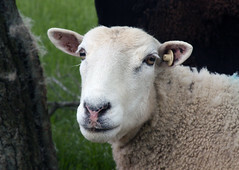 ARIES is a package of computer programs developed by the University of California at Davis for formulating and analyzing rations for sheep. 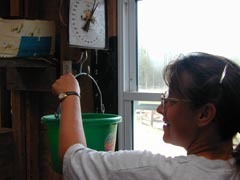 Oviration is a Canadian program that enables sheep farmers to formulate their own sheep nutrition program. 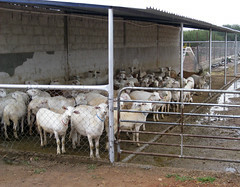 The author of Sheep 201 has developed several Excel spreadsheets to assist sheep producers in feed management decisions. RationEvaluator allows the user to evaluate the current ration that is being fed. The ration can be balanced by changing composition of the ration, using the available feedstuffs. RationMixer can be used to batch mix rations. NutrientCosts allows users to compare the cost of different feedstuffs. There are many online versions of Pearson's Square. Pearson's Square has various other real-world applications. There are times when adjustments may need to be made to otherwise balanced feeding programs. You may wish to increase the feed intake of animals that are in poor body condition and likewise reduce the intake of obese sheep. These kind of feed adjustments should not be made during critical periods during the production cycle. For example, reducing the intake of a fat ewe during late gestation can cause her to develop pregnancy toxemia. 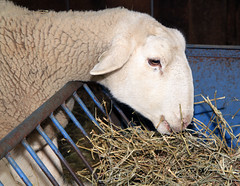 Conversely, increasing the feed intake of a thin ewe during late gestation may increase the size of her unborn fetus(es), making the pending delivery more difficult. Activity can alter nutrient requirements. Livestock that have to travel farther for their food and water have higher nutritional requirements, as they expend more energy. For this reason, sheep on pasture have higher nutritional requirements than housed sheep. Weather and climate can have a significant effect on nutrient requirements. When it is cold, sheep require more energy to maintain their body temperature. Critical temperature is the lowest temperature or wind chill at which no additional energy is required to maintain core body temperature. There is a 1 percent increase in energy requirement for each 1°F that the temperature is below the sheep's critical temperature. A sheep's critical temperature depends upon the length of its fleece (and other factors). 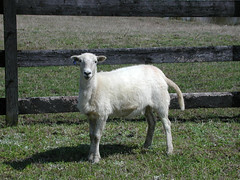 It is about 28°F (2°C) for a sheep with a 2.5 inch fleece and about 50°F (10°C) for a freshly shorn sheep. 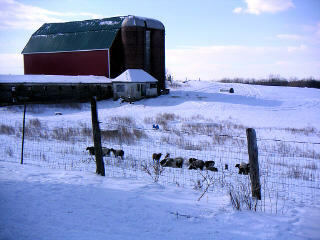 It is difficult to balance rations when sheep are free ranging on pasture. While you can determine the nutrient composition of fresh growing forage, it is difficult to determine intake, especially in a mixed sward. When sheep are grazing, they are usually given free choice access to a trace mineral mix to make sure their mineral and vitamin requirements are being met. It's similar to people taking vitamins or other supplements. When forage quality is low, protein tubs or blocks are sometimes provided. It is estimated that sheep will consume 2 to 4 ounces per day of a poured nutritional product. Monitoring body condition of grazing animals is a good way to determine if their nutritional needs are being met by the forage. Poor body condition is an indication that supplementation is advisable. Late updated 03-Mar-2019 by Susan Schoenian.